Sometimes we take NaNach for granted, not appreciating the faith and truth it gives us. The following is a recent conversation I had on Facebook that gave me new appreciation for Na Nach Nachma Nachman MeUman. Simcha Nanach: when you have all the Jews praying for months to save some of their brothers from a nation (the Japanese who showed no sense or compassion imprisoning a few young boys on absurd charges that they were C"V drug running) it isn't surprising to see such calamity befall them. what do you think that Jewish prayer goes unheeded C"V?! imagine if everyone would have been saying Nanach! Bais Yaakov Girl i dont think we on this world can understand the reason why natural disasters on this world happen! Simcha Nanach הכרתי גוים נשמו פנותם החרגבתי חוצותם מבלי עובר נצדו עריהם מבלי איש מאין יושב, אמרתי אך תיראי אותי תקחי מוסר ולא יכרת מעונה כל אשר פקדתי עליה וכו', ופרש"י זה לשונו הבאתי פורענות על האומות כדי שתראו ותיראו כמו שהוא מסיים והולך אמרתי אך תיראו, עכ"ל.
Simcha Nanach so even though in this case I was suggesting that the cause was not due to our wrongdoing, it is still the proper approach, to consider and ponder what it is that H"Y is doing, because H"Y wants us to live our lives as a conversation with Him, and everything He does is a communication with us. Simcha Nanach Great blessings of Na Nach Nachma Nachman MeUman! Yeshiva Bachur You and the Christians...both just "give up" because of guilt of taayva, which is clear from your statement. Simcha Nanach first of all you should be careful how you speak, Rabbi Nachman warned not to even joke about heresy and idolatry (as the Sages learned from Yayhu who said, Lishaim Shumayim, that he would serve Baal, and in the end that caused him to sin), it is also forbidden to say names of heretics (see Tehilim 16, "ubal essu es shimoasam al sifusay", if you don't say NaNach, at least you should be saying Tikun Haklali, and you would of known that). Simcha Nanach you are judging people who have come from deep levels of tuma and personal tragedy and trauma, and have drawn close to the Tzadik and have slowly begun to fix up their lives. Simcha Nanach take yourself for example, if you would start B"H to say Na Nach Nachma Nachman MeUman, how much you'd have to work to undo all the craziness the rabbis and society have impacted on you. I know lots of people who have gone through trauma, and have remained functional and normal people. Simcha Nanach professional help? So you pur more belief in doctors - who the Sages told us, the best doctors are material for hell - more than in the highest Tzadik that H"Y sent to us to help us?!?! Yeshiva Bachur I was walking in monsey and I heard noise in someones back yard. I went to the back, and there was a nanach with three girls smoking weed...major "tzaddik" eh? Simcha Nanach again you are so quick to judge people! Simcha Nanach do you know where that person would be if he wouldn't have Nanach? Simcha Nanach the Talmud says that when one has someone sick in the house he should go to the Tzadik!!!!! Those that choose the doctor instead are really sick and a little unfaithful to the Torah C"V!!!!! Don't judge people that I like"
Simcha Nanach someone that sits and learns Torah, if after some time he doesn't come to the Emess, that there are real tzadikim in the world, this is a sign that he's not learning to find H"Y and the Emess, and then all his learning is Sam Hamuvess C"V.
Simcha Nanach If not only they don't come to the Emess they keep other people away from the Emess, that is evil! 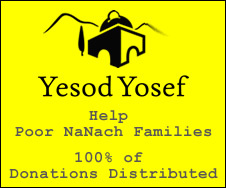 Simcha Nanach the simple person who is suffering and does aveiros, but he is honest to himself and to H"Y, and wants to right himself and do teshuva, but keeps falling into taivos, that is his nisayon in life, and we can only try to help him. But a rabbi, who claims to know the emess and is just lying to himself and to others, and misleading sometimes thousands of people, that is a terrible atrocity! Simcha Nanach you should take time to ponder this conversation, and scream to H"Y that in the merit of Rabbainu, Na Nach Nachma Nachman MeUman, you should see the truth! Simcha Nanach Rabbi Nachman taught that the truth is a powerful light, so that even a person who is in the utter depths of darkness, if he speaks to H"Y words of truth, that is words even from his darkness - but the truth of where he is, H"Y will Himself, illuminate a way for the person to ascend. Simcha Nanach So ask H"Y truthfully what it is your leaders believe in and follow, and why they have led you to put your faith in doctors and the like, and reject being able to connect personally to the Tora and H"Y.
Simcha Nanach what you call people learning, I call philosophers, may H"Y save us from them! The Zohar refers to them as "shaiden yihudai" jewish demons! Simcha Nanach Do you believe in the Zohar? Simcha Nanach The Zohar says that the exile of Egypt was the learning of the Talmud, think about it, what was Shevet Levi (the free tribe) about - singing to H"Y! Simcha Nanach but when you sing, being that you don't have a beard the Zohar considers you to be an aspect of a woman, that makes your singing, Kol Easha - which is Erva! Simcha Nanach Rabbi Nachman teaches that even if one has an awful voice and can't sing on tune, he should sing. Simcha Nanach but it seems that you are more interested in pundriks and fake rabbis. Simcha Nanach It's amazing that we are having this conversation now, Rabbi Nachman taught that now a days all beginnings start with Purim, so here's your chance, your new beginning to get out of the klipa and begin serving H"Y!